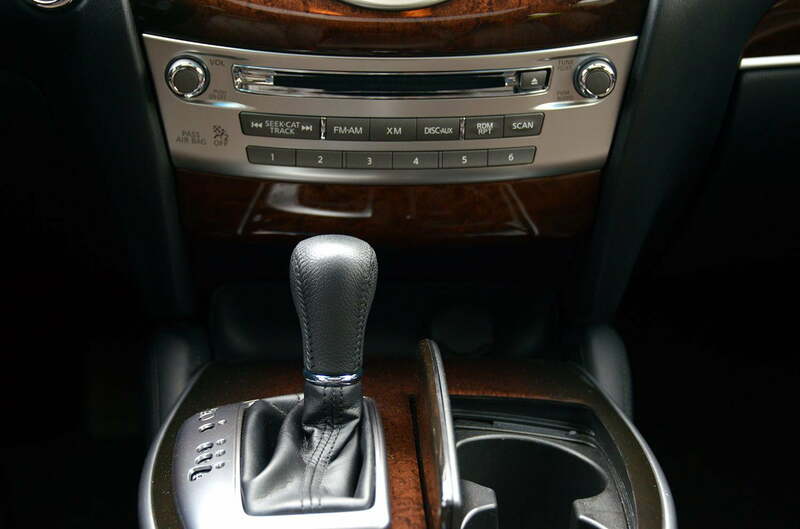 The 2013 Infiniti JX35 is one of the smartest cars on the market, with a proverbial treasure trove of active driver safety and convenience tech. Throw in ample cargo space and it’s easily one of the finest SUVs we’ve driven. I’m not one to get excited over SUVs, regardless of how much “sport,” “utility,” and “vehicle” they claim to have. That also goes for luxury, er … sorry, “luxury” models. And before I jumped into one, my perception of the 2013 Infiniti JX35 was no different. But when my four-wheeled office arrived last week – one look at its silky, smooth dimensions and I figured I had something special on my hands. Turns out I was mostly right. Kitted out with a $3,100 technology package that includes luxurious accoutrements like a heated steering wheel, heated and cooled front seats (back seats, too), and a remote engine start system, the 2013 JX packs enough of a tech salvo to draw the attention of a secret government watch list. But all of that is totally snooze-worthy when compared to the JX’s advanced drivers’ aids like Forward Collision Warning (FCW), which beeps and tenses up the seatbelt when approaching a vehicle too quickly, a Lane Departure Warning system (LDW) that warns you when you’ve drifted out of a marked lane without signaling, and Blind Spot Warning (BSW) that watches out for pesky Priuses in the JX’s left and right blind spots, beeping if a signaled lane change is attempted. OK, but here‘s where minds start getting blown. 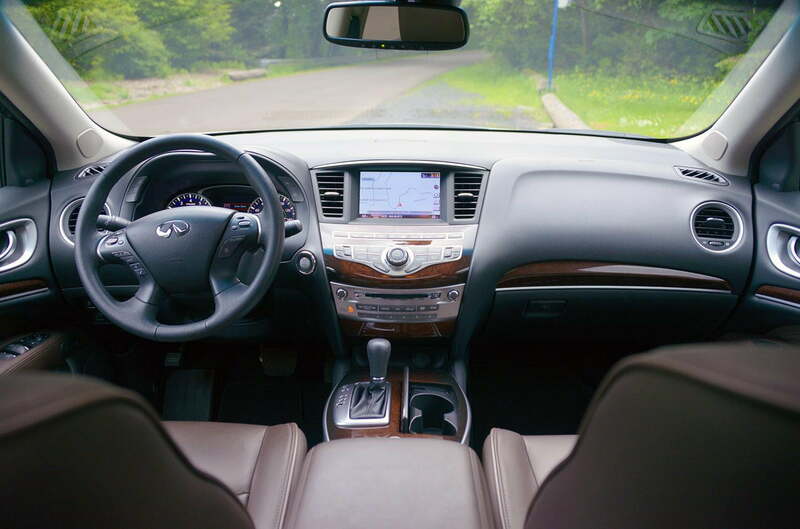 The 2013 Infiniti JX35 is one of the few vehicles on the road that offers a near-autonomous driving experience. That’s right, the future is now (cue the lasers and neon lights). Pressing a button on the steering wheel with an icon that looks like a car surrounded by a Jedi force field (at least to this nerd it does) activates an additional set of driving aids: Distance Control Assist (DCA), Lane Departure Prevention (LDP), and Blind Spot Intervention (BSI). DCA is arguably the standout feature here. It maintains a certain distance between the JX and the car ahead by automatically applying the brakes for you. DCA can even bring the JX to a complete stop, although it will only remain stopped for a few seconds before an audible tone comes on informing you to place your foot on the brake. Otherwise, the car starts moving again. My only real complaint with DCA during my review was that the braking calibration seemed a little wonky. Regardless of the distance set, sometimes the automatic braking took too long to kick in, which can be a little jarring, while other times braking was abrupt, even though there was plenty of space left between myself and the car ahead. Now, I’m all for trusting tech and a huge proponent of autonomous vehicle technology, but if I felt a little uneasy with DCA I can only imagine others will as well. My suggestion: Take the time to learn the how the system works. 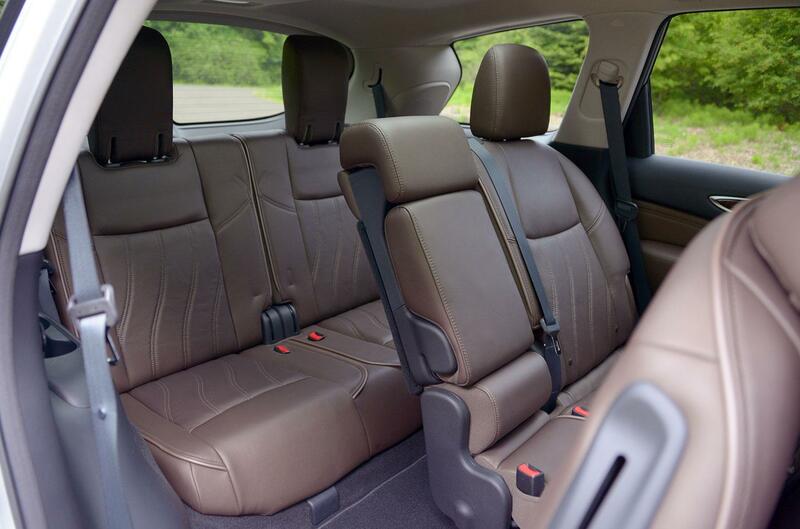 I happen to think practicality and comfort go hand in hand, which is why families will really dig the JX. At the end of our long list of acronyms, both LDP and BSI behave much the same way. The former automatically attempts to bring the JX back into its lane by automatically applying the brakes to the opposite tire, while the latter also attempts to bring the JX back into its line when attempting to switch lanes with a vehicle in its blind spot. While we’re still a ways out from true autonomous vehicles, when used in conjunction with the adaptive cruise control system, the 2013 JX is one of but a handful of vehicles capable of closely mimicking such a feat. Of course drivers still bear all the responsibly of navigating safety from A to B, but at least the JX makes it a little easier. 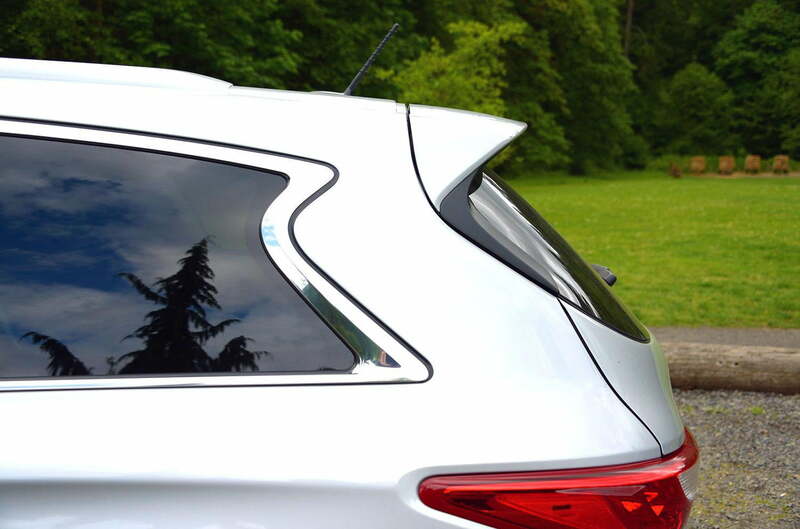 Speaking of easy, a couple of other features make driving the windswept SUV a breeze – and a lot safer, too. 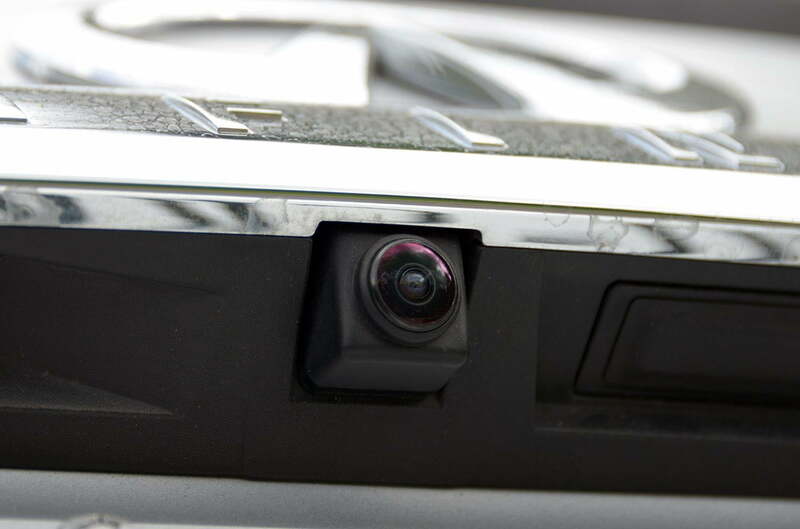 A 360-degree camera system provides an around-the-car view of the JX at low speeds. There’s also a bird’s-eye view that pieces images together from four cameras mounted around the car, complete with trajectory lines so you can see exactly where you’re aiming. I can’t even begin to stress how much better this makes parking the JX in tight spaces Hell, in all space. In fact, NHTSA if you’re reading this: Please require all automakers make 360 cameras standard. Kthnx. 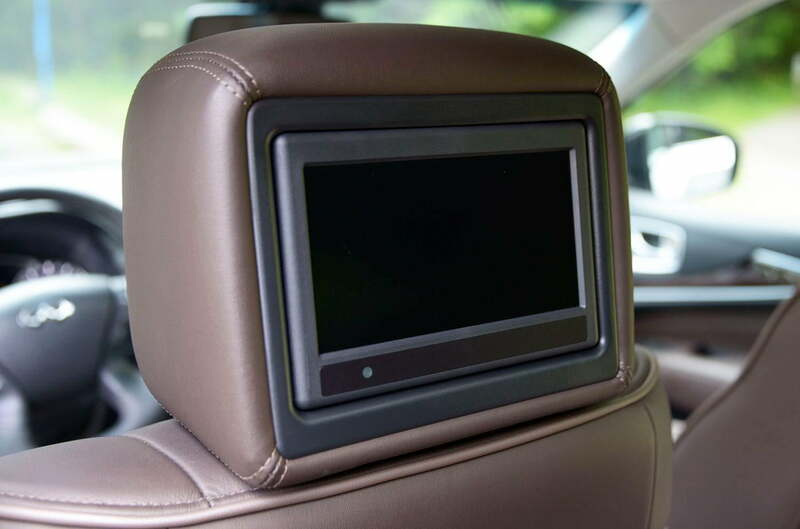 What’s more, drivers can choose to fill the JX’s eight-inch touchscreen with a full-size view of the backup camera, front-facing camera, or the passenger side camera, making the JX infinitely (zing!) easier to navigate. Additionally, Infiniti’s Backup Collision Intervention system, or BCI (I lied, there was one more acronym to remember), uses sensors that fan out directly behind and to the sides of the JX. The driver is given three warnings: The first causes a light to turn on depending on what side the car is approaching. If that doesn’t get your attention, the touchscreen turns red, accompanied by another audible warning. Ignore that and those automatic brakes kick in, forcing your foot off the accelerator. The JX includes support for Bluetooth hands-free calling and audio streaming, which works well once paired. The problem is that Infinity likes to differentiate between Bluetooth phone devices and Bluetooth audio devices. Essentially they amount to the same thing and asking to differentiate while pairing is worded poorly and makes the process more confusing that it needs to be. 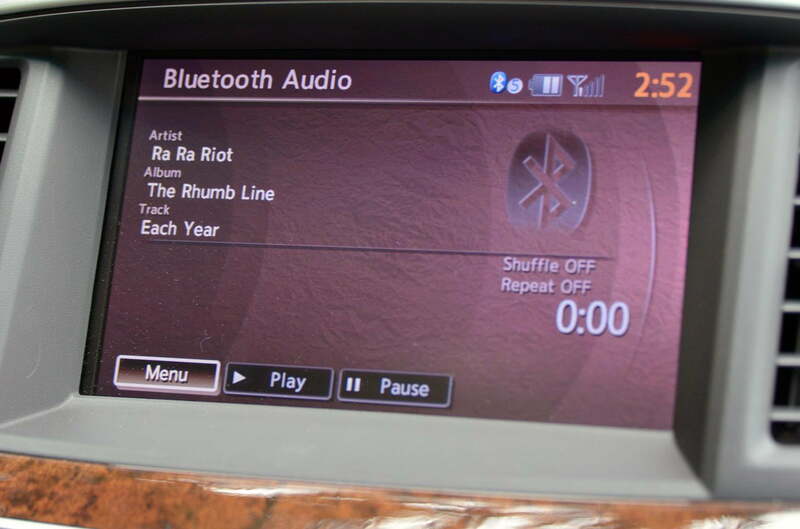 Other supported audio formats include an iPod/USB connection, single-disc CD player, and SiriusXM satellite radio. Our review car came equipped with an upgraded 15-speaker Bose sound system which hummed away nicely after some initial tweaking. 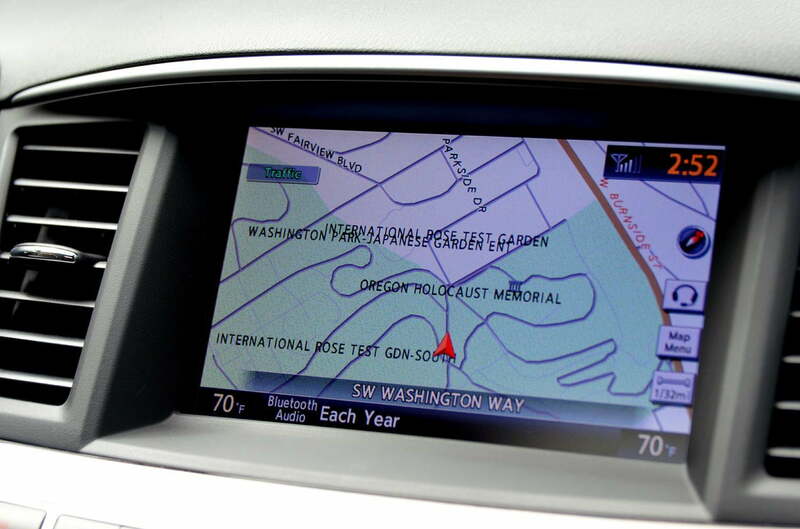 An upgraded HDD navigation system is also on hand, which in addition to the previously mentioned eight-inch touchscreen utilizes a rotary controller as well as voice command recognition software. 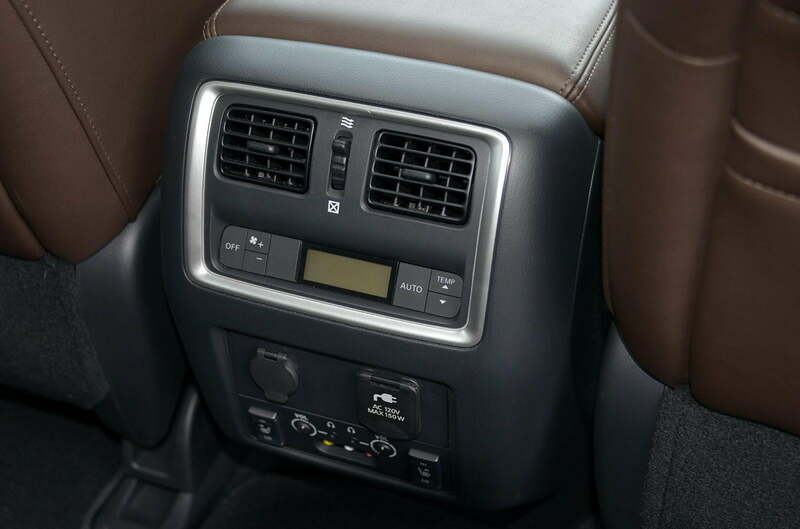 The rotary knob is a nice option to avoid pecking at the touchscreen, and voice recognition makes it easier to enter text for music selection or destination inputs. There are even 3D map renderings for some added pizazz. Finally, the new Infiniti Connection telematics system pipes the Web directly to your dashboard via an onboard cellular connection. Drivers can search the Web for destinations, and the system even provides automated emergency assistance and geofencing capabilities. That’s a pretty robust list of tech features packed into one car. But what’s more impressive is the JX’s price tag. The JX starts at modest $42,000, with our tester pricing in at a reasonable $55,000. 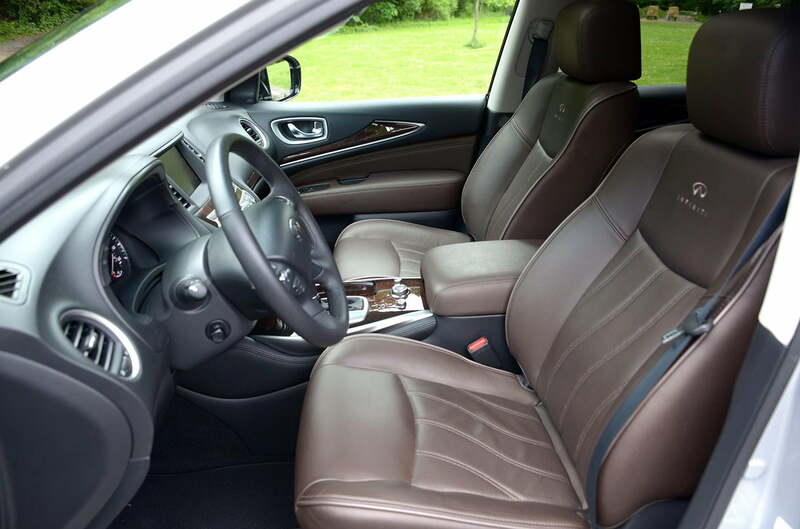 Despite an expressive exterior, the 2013 Infiniti JX35’s interior is a little more subdued. That doesn’t mean it’s boring, far from it, but it’s clear Infiniti’s designers were concerned with crafting a cabin that was more practical than flashy. … Decidedly comfortable in its skin and with a youthful exuberance that just isn’t evident in some of its rival’s designs. I think that’s why I like the JX’s interior so much: Every design choice has a purpose. The center armrest houses a cavernous console underneath that fit just about any loose item I had on me. Its small top shelf quickly became home to my phone and wallet. A minor detail maybe, but I really hate sitting on my wallet while driving, and with so many people owning smartphones, it’s surprising how many cars lack a dedicated spot for them. And no – cupholders do not count. Even the door handles were perfectly shaped and deep enough, with a hard bottom, so I could throw my keys in there without worrying they’d fall out. I happen to think practicality and comfort go hand in hand, which is why families will really dig the JX. Too many interiors are concerned with looking fancy and flashy but the JX’s interior dimensions are clean and comfortable. 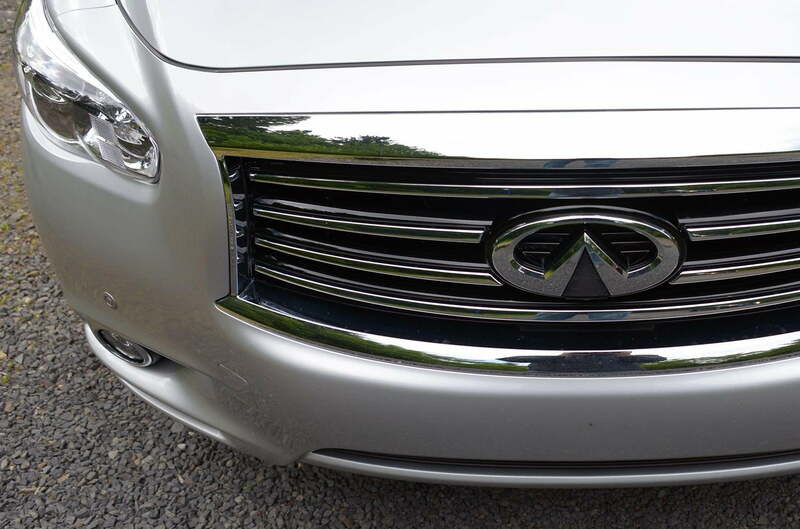 Still, the 2013 Infiniti JX35 is a luxury car, and should feel like one. It does. Ours came wrapped in leather (seats, steering wheel, and shifter) with matte silver accents and warm wood flourishes on the center console, door accents, and dash. For such an advanced vehicle, there’s a lot of negative space on deck. The dash features just enough contours to make things interesting and the center armrest is wide, eliminating any potential territorial disputes between drivers and co-pilots. It’s the same story as we crawl to the back of the car. The second row provides plenty of arms, leg, and shoulder space for full-sized adults, and can even tilt and slide 5.5-inches fore and aft. Dedicated climate controls back there ensure everyone stays nice and cozy. Because the JX is aimed at families, Infiniti offers a theater package ($1,700) that adds two seven-inch color sear-seat monitors, two wireless headphones with remote, and AUX audio/video outputs. While certainly a cool feature, it’s pretty pointless. You’re better off buying two iPads (or the Android/Windows equivalent – easy there Apple haters) and filling it with content yourself. As for the third row of seating, it’s always a welcome feature for any burgeoning brood. While the second row should prove comfortable enough for all sizes, the last row is best suited for smaller adults and children. Like the second row, the third row seats recline. 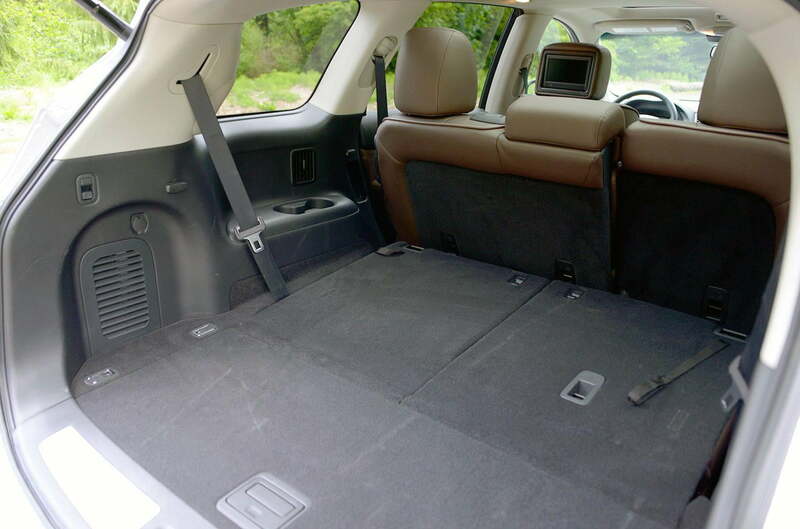 Finally, you don’t buy a large SUV without wanting extra space to haul stuff – and the 2013 Infiniti JX has plenty of space on tap. With all seats in place cargo space is a meager 15.8 cubic feet, but fold the second and third row seats down and that number swells to 76.5 cubic feet. Where the larger QX looks oafish and bit too serious for its own good, the JX looks like it just returned from a dip in the Lazarus Pit, appearing decidedly comfortable in its skin and with a youthful exuberance that just isn’t evident in some of its rival’s designs. I’m a huge fan of Audi’s Q7, which for my money is the best-looking SUV in its class, but the 2013 JX comes in a deserved second place. Sure it has a tendency to appear a little longer than I’d like, but it’s a huge upgrade from disjointed look of the Acura MDX. The 2013 Infiniti JX doesn’t come packed with an explosive engine – far from it. The 265 horsepower and 248 pound-feet of torque its 3.5-liter V6 doles out are merely adequate mojo during most driving situations. Our JX was upgraded to the AWD model, but FWD is standard. That’s because at 4,280 pounds, the JX is a big gal; she simply can’t get up to speed very quickly. The added frustration of the CVT doesn’t help matters, translating into a perpetual feeling of anxiety every time I needed to hustle along with traffic. Naturally, you’d think a drop down into second gear would help but in truth it seemed to do nothing. The JX still puttered along like a sloth. That’s OK though, because switching from “normal” to “sport” mode would surely help, right? Wrong. Whatever oomph that’s meant to flourish from switching to sport mode is held prisoner in some automotive Alcatraz. It might not be the quickest or most exciting to drive… but nevertheless, the JX definitely deserves serious consideration. I even took to babying the throttle, applying my foot to the gas ever so gently but again – nothing. Mashing down on the accelerator resulted in the same disappointment. It’s the same story downhill as dropping down into second gear either forced me to drop further down into first or ride the brakes like a schmuck. However, if you’re seriously considering a three-rowed SUV, chances are you’re not looking for go-kart inspired handling. No, it’s the longer stretches you’re after… and maybe even decent fuel economy? Two things: First, forget spirited cornering. Just don’t even think about it. Instead, aim the JX in a straight light and drive. Second, ratchet that mode selector from sport to eco and prepare for some fuel-saving fun. 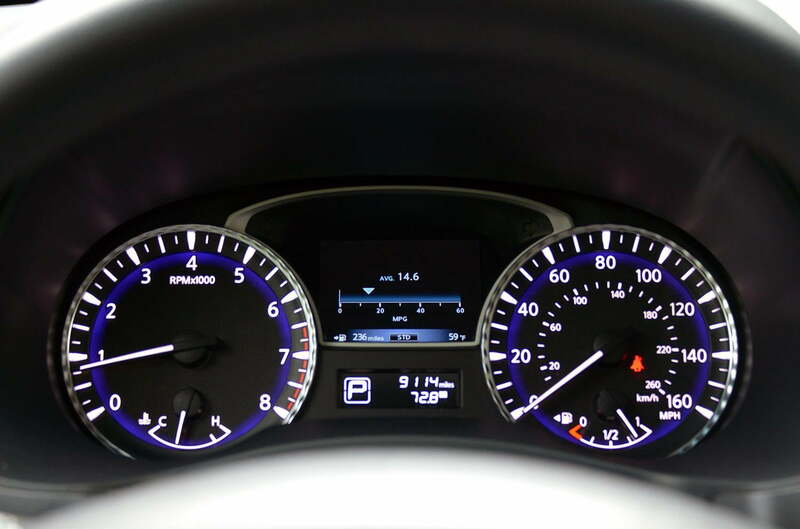 In eco mode, throttle response is stymied even further, no surprises there, however, as mentioned earlier, our JX came equipped with the Driver Assistance Package, which includes Infiniti’s Eco Pedal. Think of Eco Pedal as a “smart pedal” that’s somewhat alive and aware of what you’re doing. Step on the gas too hard and it pushes back with little regard for your feelings. It might not be every driver’s cup of tea, but I really liked how the entire system is designed to maximize fuel efficiency and encourage/teach better driving habits. Plus, it beats staring at animated leaves growing or a confusing table full of arbitrary percentages found in other cars. 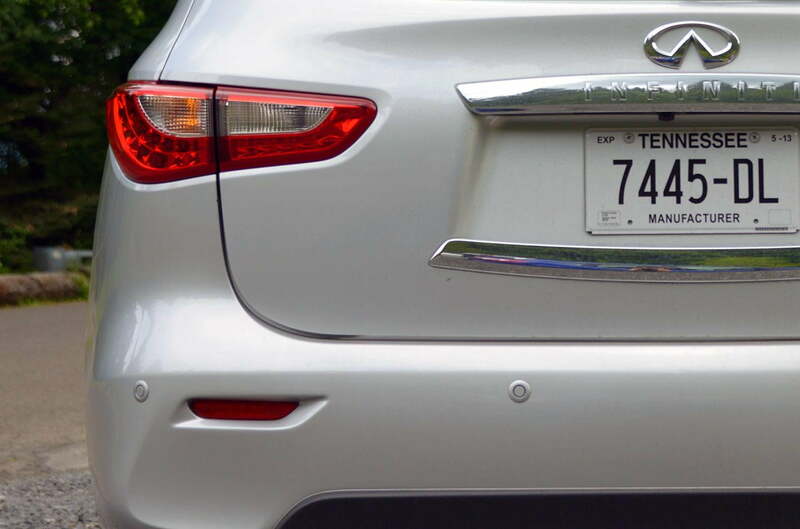 The 2013 Infiniti JX35 is a rare breed of SUV, in that it actually gets decent gas mileage in spite of its pudginess. EPA-rated fuel economy for the front-wheel-drive JX returns an estimated 18 mpg city, 24 mpg on the highway, and 21 mpg combined, while the all-wheel-drive model nets 18/23/20. 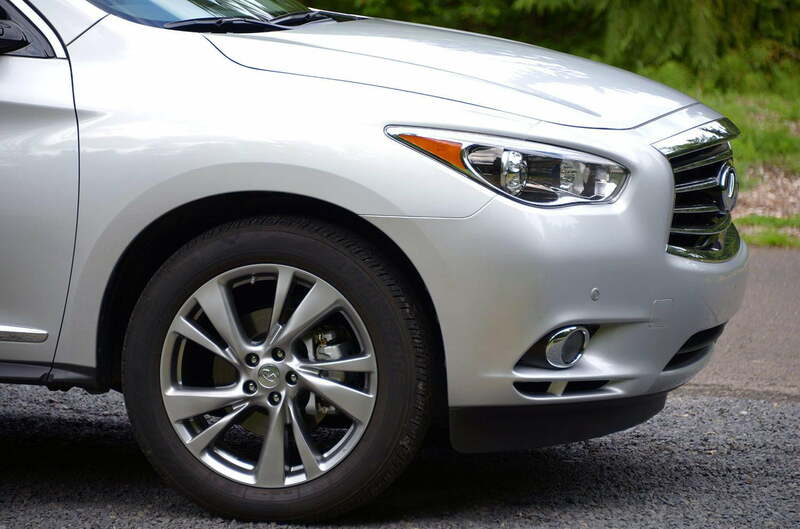 As we come to a halt, what exactly is the final verdict on the 2013 Infiniti JX? It’s rather positive, actually. While it’s far from perfect, the JX ticks all the right boxes that we’d want from a three-rowed mobile command center on wheels. The design is decidedly handsome and escapes that overdone look so many crossovers exhibit. It’s also one of the smartest cars on the market, with a proverbial treasure trove of active driver safety and convenience tech. Throw in ample cargo space and it’s easily one of the finest SUVs we’ve driven. It might not be the quickest or most exciting to drive – Acura’s MDX wears that crown – but nevertheless, the JX definitely deserves serious consideration.